Winner of the Mildred L. Batchelder Award Won the Buxtehulde Bulle Prize for Youth Literature Nominated for the Evangelischer Buchpreis An ALSC Notable Children's Book Kids' Indie Next List Gripping WWII fiction for fans of Code Name Verity and Between Shades of Gray At the start of World War II, ten-year-old Franziska Mangold is torn from her family when she boards the kindertransport in Berlin, the train that secretly took nearly 10,000 children out of Nazi territory to safety in England. Taken in by strangers, Frances (as she is now called) courageously pieces together a new life for herself. But what will happen to her when she is finally reunited with her family, now that she's a stranger herself after seven years of war? Originally published in Germany, Anne Voorhoeve's award-winning novel is filled with humor, danger, and romance. 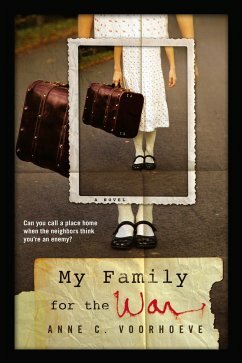 "With the personal Kindertransport history, the intense drama about family, faith, guilt, love, and loyalty in wartime makes this an important addition to the Holocaust curriculum." - Booklist , starred review "Events and facts are expertly woven into the girl's emotional growth, and changing relationships . . . provide a rich exploration of identity and self. With a compelling main character and taut and insightful story line, this novel is sure to find no shortage of readers, and it adds a valuable perspective to collections of World War II fiction." Anne C. Voorhoeve, geb. am 19. Dezember 1963, schrieb ihre erste Geschichte mit sechs Jahren. Sie studierte nach der Schule Politikwissenschaft, Amerikanistik und Alte Geschichte in Mainz und arbeitete unter anderem als Assistentin an der University of Maryland, als Verlagslektorin, Drehbuchautorin und in der Öffentlichkeitsarbeit eines evangelischen Klosters. Anne C. Voorhoeve lebt in Berlin. "With the personal Kindertransport history, the intense drama about family, faith, guilt, love, and loyalty in wartime makes this an important addition to the Holocaust curriculum." "Events and facts are expertly woven into the girl's emotional growth, and changing relationships . . . provide a rich exploration of identity and self. With a compelling main character and taut and insightful story line, this novel is sure to find no shortage of readers, and it adds a valuable perspective to collections of World War II fiction." "An engaging and often moving coming-of-age story. A poignant, thoughtful work." "This multilayered story [which] cogently explores themes of motherhood and adoptive families is gracefully portrayed." "My Family for the War is a must-have for young adults. The novel is simultaneously beautiful, touching, and heart wrenching." "This is a solid addition to Holocaust collections, life on the home front during the war, and for discussions of what is a family."